The old Istanbul wall lives! The old Istanbul city wall dates from the fifth century and protected the city for almost a thousand years: it served as a defensive structure till 1453. Since then it has beencrumbling down and has never been restored to its old glory. Which doesn’t mean a walk along the wall – about 6.5 kilometres long – is not worthwhile! Along the old city wall the Constantinople of the past meets present-day Istanbul: the wall may be useless as a defensive structure, but it’s still very useful in today’s every-day life. On, around and even in the wall there’s always something going on. Along the first section of the wall, close to the Marmara Sea, the soil is being used by farmers who grow all sorts of vegetables and sell their crops on the spot at the end of the day. On the dilapidated parts of the wall overgrown with grass cattle is grazing, in the niches underneath the wall small businesses are nestled as well as some poor people’s ’homes’, and horses stand in the shade waiting their turn at the blacksmith’s across the street. On bushes on the wall laundry is drying and around the former city gates you can buy all sorts of things – shoes, toys, furnishings. The old Istanbul wall, you could say, lives! The beginning of the walk is marked by the imposing and recently restored Yedikule Hisari (Seven Towers Castle), which is definitely worth a visit. The original parts of Yedikule were founded in the fourth century, after which different rulers added their own towers or gates. Four of the seven towers were built as part of the old city wall. The castle serves different purposes: defensive structure, entrance to the city, prison and execution site. Now it’s a museum, where it is even permitted to climb the walls. By all means, do that: the view over the sea and the city is breathtaking, and gives an idea of the walk along the wall to the north. After Yedikule Hisari it’s important to keep the wall to your left for the rest of the walk. Not that there’s anything fishy about the other side, but it’s just not a nice walk: the traffic artery below assaults your lungs and your ears. Only at the very beginning of the walk is it nice to take a peek on the ‘wrong side’. There the former canals are now filled in and in use as gardens. The municipality rents them to people who cultivate the land and sell their crops on the spot. Many of those farmers also live on the land. Their houses are built against the wall, with the occasional satellite dish attached to it, and on the dilapilated parts of the wall cattle is grazing. After the gardens, use the gate to go to the other side of the wall. In the almost seven kilometres to the north beautiful well-maintained neighbourhoods follow less prosperous and even poor areas of town mainly inhabited by migrants from the east and southeast of Turkey. They came to Istanbul to find work and built shanties against the wall. Chicken and other livestock rummage. There are also modern and conservative parts of town. The conservative are easily recognised: more than anywhere else in the city (totally) covered women walk on the street. A large number of these people are not originally from Istanbul, but mostly from central Anatolia. In the middle of such a neighbourhood, one of the most impressive museums of Istanbul can be found: Kariye Museum. Built as a church in the eleventh century, later used as a mosque and now restored. It’s a miraculous experience to enter such a small building and come upon really beautiful mosaics and frescoes with images from the lives of Jesus and Maria and figures from the Old Testament. By the way, around Kariye Museum it is nice to have a rest: there is a small square with terraces where light or substantial lunches or dinners can be ordered – or just a nice Turkish coffee or tea. Not only the city along the wall, but also the wall itself is revealed in different shapes. Most parts are old, crumbled and overgrown with bushes and grass. Neglected, yes, but in the end it’s also spectacular how these broken parts of the wall stand out against the Istanbul sky. Here and there the wall is restored, but maybe the city government should not have done anything, or should have hired better experts to do the job. The renovated parts look too smooth and new and don’t remind us at all of the centuries old defensive structure. On other spots, modern life interferes with the wall, especially as congested streets disturb the walk along the wall. But then‚ ‘disturb’ also sounds too negative. The big streets are an inevitable part of a city of around 17 million inhabitants and really make“ the walk into how we present it here: a coming together of ancient Constantinople and modern Istanbul. The previously mentioned Kariye Museum is situated north of one of the busy streets that intersect the wall, the Fevzi Pasa Caddesi, by the former Edirne Gate. In the same neighbourhood as Kiraye Museum another jewel can be found: Tekfur Sarayi, that is Tekfur Palace. It dates from the 13th century and is being restored – anyone who wants to take a look at the progress being made can go in, even though a sign tells you not to enter – nobody will stop you. Taking a look around is no problem, and it also offers an insight into the old-fashioned and sometimes dangerous working conditions on construction sites. From Tekfur it’s only a short walk to the Golden Horn, the stretch of water that separates the European part of Istanbul into a southern and a northern part. At the end you can even climb the wall: there’s a staircase built alongside the wall which takes you up easily. From here the view over the Golden Horn and the bridge over it is impressive. From there you can also see the place from where the ferry departs. For around one euro the boat takes you back to the tourist heart of Istanbul, with a few stops on the way. The stunning view of the city from the water completes the Istanbul experience. The walk doesn’t have a hard and fast route: from the beginning at Yedikule Hisari – to be found in every travel guide, as is the way to get there – you just follow the inner side of the wall heading north. You turn left or right as you please, keeping the wall on your left, till eventually you inevitably reach the Golden Horn. You can take things to eat with you, but that’s not really necessary. In the streets along the wall there are plenty of sandwich sellers and small diners, fruit and vegetable shops and here and there (for example around Kariye Museum) terraces and small restaurants. In this part of town tourists are rare, and some areas are rather conservative. So here’s some clothing advice: short trousers and skirts that leave the legs bare are not the best choice, both for women and men. The same applies to sleeveless shirts. A very good book to use along the walk is Byzantine Istanbul, written by Dutchman Robert van den Graven but written in English. A practical book with lots of historical information about places around the wall (and other buildings and areas from the Byzantine period). It’s available from every good bookshop in Istanbul (in the tourist area Sultanahmet for example in the bookshops on Divan Yolu). The historical highlights along the route (Yedikule Hisari, Tekfur Sarayi, Kariye Museum) are of course also mentioned in every travel guide. Author fgeerdinkPosted on December 30, 2007 Categories Istanbul, Stories1 Comment on The old Istanbul wall lives! Grandmother tosses a piece of meat towards me. Plop! About one and a half kilos I suppose, with quite a lot of fat on one side. I put the knife on the meat at an angle. First I want to get rid of this fat. With an arching motion I throw it into a bucket. The rest of the meat I cut into small pieces. Yesterday this cow was in the shed bleating its last bleats. Until the butcher came. A moment later blood streamed through the snow and plastic boxes were filled with organs, legs, slabs of blubber, the head. Mother and daughter were helping. They tore apart legs, carried away parts of the animal, sharpened knives and the axe. This morning I found the beast on the kitchen floor and soon after that grandmother, mother and daughter were sitting on the floor around a round table to cut and chop the enormous cow parts. I would like to help, I say. That’s not necessary, mother says, and by the way, it’s rather difficult. True, cutting a rib cage or rump or leg into pieces, that might be too much for me, but in the meantime grandmother cuts big chunks of meat into small pieces. In my best Turkish I say: ‘Those small pieces I can do, shall I give it a try?’ They make room, I sit down cross legged, take a big knife. The box between grandmother and me is soon filled. These smaller pieces are for the family, the bigger pieces are distributed to poorer families in the village, just as tradition dictates. I cut meat like never before. Around me pieces of rib cage, legs, shanks, a bucket of greasy offal, a box of scraps for the dog, and my foot gradually feeling wet from a small pool of blood. Grandmother is enthusiastic about my work. Aferin, aferin! (bravo, bravo! ), she says again and again. A pan is put on the stove, the first load is prepared for dinner tonight. But then I don’t touch the meat. I’m still a vegetarian. 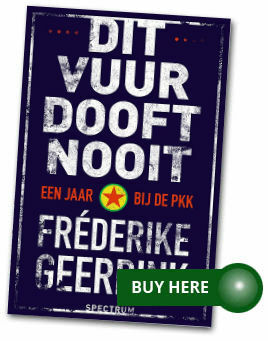 Author fgeerdinkPosted on December 21, 2007 Categories Blogs, Everyday life, ReligionLeave a comment on Aferin, aferin! One thing I remember from the time I lived for two months in the Istanbul mahalle (neigbourhood) Kuzguncuk, is when my doorbell rang a few times and a man appeared to ask if ‘that car is yours and if so could you remove it?’. The man was maybe working for one of the film crews which quite often were on location in the mahalle. I saw funny things happen from behind my work desk, from where I had a nice view over a street and small square. One guy, for example, seemed to be hired just to walk around and pick up tiny bits of rubbish like cigarette butts, small scraps of paper and leaves off the street, with a bag in his hand. Once I didn’t know there was a crew working around the corner, and was at first frightened and then surprised when I saw one man running after another, then the men shouting at each other and eventually hugging – it was a soap opera being recorded. I live in another neighbourhood now. It’s not at all interesting for filming – to begin with, the guy picking up rubbish from the street would need a whole team of colleagues here. Now I hear the people of Kuzguncuk are getting a bit sick of one film crew after another occupying their streets. They are gathering signatures now to urge the crews to at least follow some basic rules. One of them would be that they leave the streets as clean as they would like them for their own filming, as it appears they leave more and more rubbish after filming is finished! Someone even suggested the crews could contribute to a community chest from which community activities could be paid for. Very good, I support the Kuzguncuk neighbourhood. When you have a beautiful mahalle, you had better make the most of it! Now, is the number of women wearing a headscarf rising or not? The conclusion of a survey seems to be a clear “yes”. In short, 69 percent of women cover their heads, against 64 percent in 2003. Of these women, 16 percent wear a ‘turban’ (a ‘religious scarf’ as apposed to a ‘traditional’ one), against 3.5 percent four years ago. But there’s a whole lot of ‘buts’. There was another survey on the same question which concludes that the number of women wearing a scarf has gone down from 64 percent to 61, the percentage of those wearing a ‘turban’ rising to 6 instead of 16 percent. Both surveys were done in September, but the first has only now been published. The survey results were published by two different newspapers, both belonging to the same media conglomerate, Dogan Media Group. It is now said that the surveys are used to support or oppose government policies. The ‘headscarfissue’ is perfect for manipulation. The governing party is the AK Party, whose leaders in the past were spokesmen for banned Islamic parties. The AK Party says it’s not Islamic, but opponents fear that they will not respect Turkey’s secularism and that they stir up conservative Islamic tendencies in society. Now, if you want to oppose the government, you publish the figures that show an increase in (religious) headscarves – and some say Dogan had reason this week to try to influence politics and public opinion (over some financial transaction between media interests that is too complicated to explain here). On the other hand, if you want to support the government and calm public opinion, you publish the less alarming survey, as a Dogan newspaper did in September after Abdullah Gül (AK Party) was elected president. Is seems far-fetched, but it’s well known that many Turkish newspapers are not very independent, so I would not be surprised if this is actually what happened. What bothers me though, is that the choices women make are used to manipulate public opinion. What makes me laugh ironically is that the surveys are presented as investigations of the ‘religious attitudes of women’. Such an interesting issue reduced to whether or not you wear a headscarf, and if so, what sort of scarf. The whole exercise says nothing about the attitudes of women and everything about the attitudes of businessmen and politicians. Author fgeerdinkPosted on December 8, 2007 Categories Blogs, Media, Politics, WomenLeave a comment on Religious attitudes? The Turkish national flag is constantly visible. In enormous sizes on public buildings, languidly flying on central Taksim Square and next to Topkapi palace, and recently more often in a smaller version from the windows of houses. On the street there’s always a flag-vendor nearby, and demonstrators, for whatever purpose, carry every size of flag with them in huge quantities. Flag producer Günay Bayrak, the biggest in the country, couldn’t meet the demand this year. “It was not possible to increase production by more than a hundred percent”, says director Önder Günay. What is remarkable is that the Turkish flag is used to emphasize varied and sometimes opposing opinions. In recent months more and more people have been demonstrating to promote a cross border operation of the Turkish army into northern Iraq, and funerals of soldiers are often a platform to propagate this opinion. But recently in Istanbul a contra demonstration was also festooned with flags. “Both groups”, says Aruş Yumul, sociology professor at Istanbul’s Bilgi University, “feel that Turkish values are under threat and defend their vision of the country with the flag.” Advocates of a cross-border operation think it necessary for the defense of national borders deemed to be under threat, while opponents believe that military action will further alienate different groups in Turkish society and will therefore corrode the unity of the country. Especially over the last year showing the flag has become endemic. Before the parliamentary elections last summer both secularists and followers of the Islamic party waved the flag, now it’s the advocates and opponents of an attack on the PKK in Iraq who make themselves heard, and besides that there are national holidays and now and then a football party. “The flag has become a symbol of both the secular order and the Turkish religious identity, and of respect for the country’s borders. Everybody who waves the flag is convinced that he is defending the only true Turkish values”, Yumul says. You could saythat waving the flag now seems to symbolize the divisions in the country rather than its unity. She earns 500 liras per month, working six days a week, eight to twelve hours a day. Her rent is 300 liras, bills around 40 liras, transport to and from work about 75 liras. It’s obvious: she is seriously short of money. Now, I remember times when I too was seriously short of money. But that was as a student, spending money on the wrong things and at a time of life when I didn’t mind eating pancakes for a few days and cadging cigarettes from other people. Half a year after finishing my studies, I found my first job, earned a decent salary and could support myself. I was financially independent at 23. With G. – as with many Turks in the twenty-something or thirty-something age group – it’s different: she finished university six years ago, she speaks almost perfect English, and she is 31 years old. She is so sick of not being able to support herself. But finding a better-paid job is not easy. So for now, all she can do is knock on her parents’ door. They give her some extra money. That makes life easier, but also more difficult. Because G. needs their money, she has to put up with their pressure too. Pressure to come ‘home’ again and leave Istanbul. Pressure to find a good husband and become a mother. Pressure to get a haircut, buy some nicer clothes, visit the family more often. I can imagine why she’s almost desperate to find a better job. Desperate to make her favourite daydream come true: to finally tell her parents to stop interfering and let her live her own life. Author fgeerdinkPosted on November 26, 2007 Categories Blogs, restLeave a comment on Which flags? So, if you are a journalist and you write a report about something involving a crime, you have to immediately call the authorities and report it. That’s what the lawsuit against reporter Emin Bal makes clear. He wrote a story about a funeral of PKK combatants, and during the funeral slogans supporting the PKK and its leader Öcalan were shouted. He didn’t call the police, and that’s his crime. All he did was write it down and publish it. And that, in my opinion, is exactly what a journalist should do. His job is to inform the people about what’s going on, he’s not a public servant. A friend from Holland came to visit me this weekend. We were having dinner at Kanaat Lokantasi and after dinner of course we wanted tea. I ordered it ‘açık’. Friend asked what sort of tea I ordered. Well, normal Turkish tea, but then ‘açık’, meaning light. That’s the nice thing about a traditional Turkish teapot: you can get your tea as light or dark as you want it – in the upper pot is the tea, in the lower pot only boiling water, and the less you pour from the upper pot the more water you need to fill the glass and of course the more açık the tea. In the Turkish language, I told my friend, many things can be açık. The sky is when it’s sunny, spoken language is when it’s spoken clearly, and of course things like doors and windows can be açık, open. Even women can be, and in fact, I told her, we are both açık women. To her, it didn’t sound like a positive thing, almost insulting. But it isn’t: açık women, they just don’t wear a scarf.